I’m not exactly a sucker for weird distances. The yearly Get Lucky Half Marathon has a 7k race near me that I’ve never run, the Polar Dash had a 14-miler in 2014 and a 15-miler this year (which leads me to wonder how long they’ll be able to keep that up), neither of which I’ve run, and there was a 4-miler in the city that I never added to my calendar. Call me traditional, but I like benchmarking my abilities against standard distances that I’ve run repeatedly in the last six years. The idea of an “automatic PR” never really called to me. But my father-in-law put it best when he said that Fort2Base was an opportunity to run a race with different units of distance. Anywhere else in the world, a half marathon is 21.1 kilometers and you’ll see markers at every kilometer. Short of running a race measured in leagues, light years, parsecs or Planck lengths, there aren’t many reasonable options besides miles and kilometers. 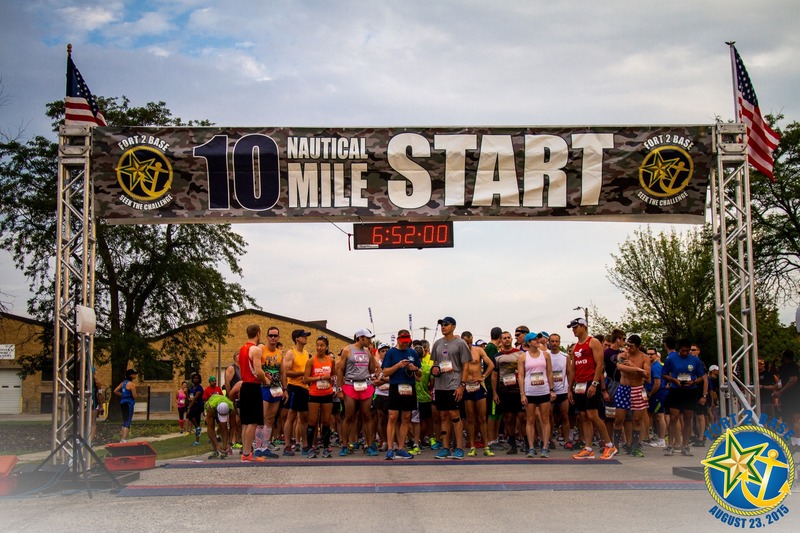 Enter Fort2Base, a point-to-point race that starts in Highland Park’s Fort Sheridan and ends in the Great Lakes Naval Station, which sports two races of 10 and 3 nautical miles. My in-laws had put together a large family trip to run it last year and the rave reviews convinced me to slate the race as my August speed test. The fact that I would achieve an instant PR was a footnote in the decision making process. 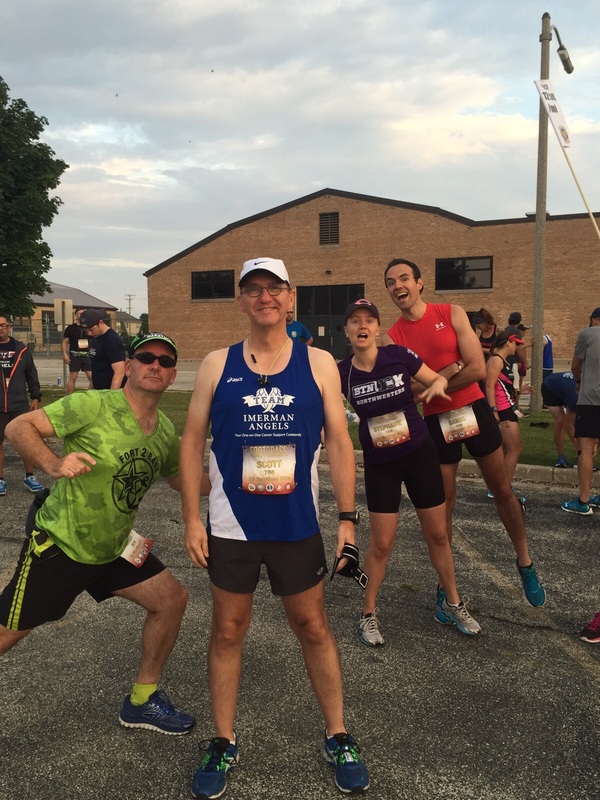 We began the race by running through and around Fort Sheridan, a former military barracks that has since been mostly transformed into a residential community and cultural hallmark of the North Shore. The stone water tower, once the largest structure in Chicago, kept watch over a large, oval-shaped park. I remember this monument fondly, as it was a key part of the North Shore Half Marathon, which I ran in 2010. As we traced our way around it, I saw the first mile marker at about 1.15 miles, the exact distance of one nautical mile. Once out of Fort Sheridan, we hopped on the biking and running path that sticks to the northbound Metra commuter rail. We ran on this trail, in a nearly unbending, straight line for another eight miles. However, I soon learned that the mile markers weren’t nautical miles as advertised, but standard miles. In other words, that first marker was long. With an annoyed grunt and a quick headshake, I got back to running. 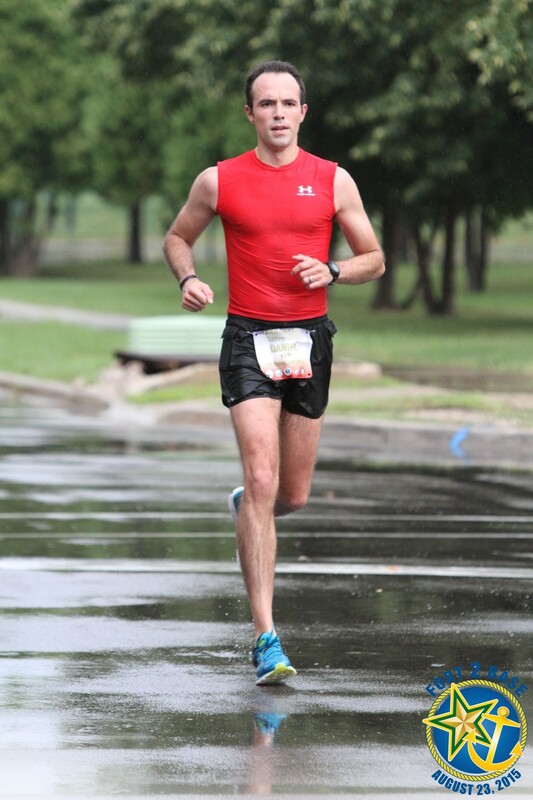 Under grey skies and with a gentle tailwind, I was rocketing through the course. By mile 7, I was behind a gentleman in American flag shorts and the first female, who seemed to be locked in stride. I passed them and briefly enjoyed my lead, for both had yet to turn on the afterburners. At mile 9, we left the tree-covered path and entered the Great Lakes campus for one large loop before finishing. The station’s red brick clock tower stood as the area’s centerpiece, overlooking the many spectators in the grassy field that unfolded in front of it. Not long after entering Great Lakes, the course took a service road toward the lake, where it plummeted until we reached the shores of Lake Michigan. It was there that I crossed the 10th mile in 1:06:36, a PR at the distance by over 90 seconds. However, my legs were heavier now, and my lungs were starting to burn. The acidic buildup couldn’t have been more poorly timed, as just ahead was Hero Hill, the upward climb back to the campus. In just under thirty seconds, that climb put another four miles of pain in my legs. I reached the top gassed but no less motivated to finish strong. A few strides later, I encountered another obstacle as I came face to face with a rapidly advancing wall of rain. Any part of me that wasn’t already covered in sweat was soon drenched. The sound of raindrops bouncing off me was oddly like rubber, as if I had fashioned a shirt out of a tent. My spongy footsteps found it impossible to avoid puddles and I had no choice but to splash through what remained of the course. I couldn’t help but think of the many times I’ve promised other runners that it will never rain so long as I’m still running. And then, just as soon as it arrived, it was gone. The skies never truly opened to reveal the late August sun, but it seemed for the moment that only one mercurial storm from the west would be visiting us today. One final turn and we were on the edge of the large, open field that acted as the clock tower’s welcome mat. I didn’t have a sprint left in me, but I pumped my arms with every last ounce of energy. Hero Hill and the sudden downpour had siphoned off a lot of time from my pace, but I was not going to complain about my 1:19:08 finishing time. 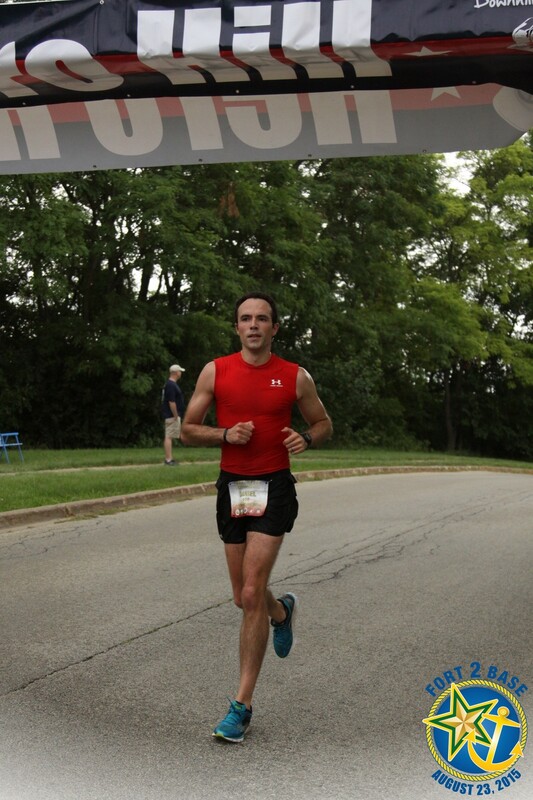 It was good for 18th overall, and 3rd in my age group. Once the race was over, I exited the finisher’s chute and positioned myself along the barricades to cheer for the rest of the field. 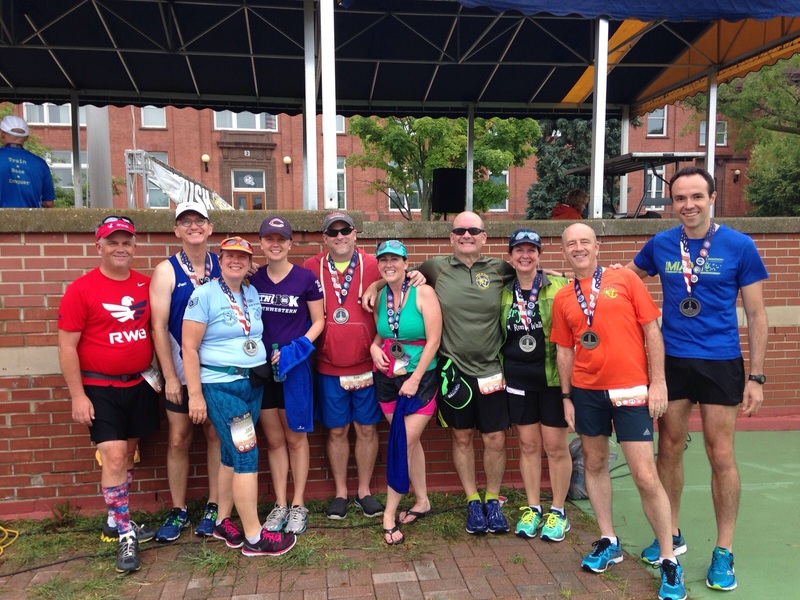 Among my in-laws, the usual diehard runners were part of the field, several of whom will join me in Berlin in just over four weeks, either as runners or spectators. But the true surprise was Steph, who signed up for the 10-nautical miler, fully aware that there was a shorter distance available to her. Though she justified it with far more colorful language, I want to believe that she threw down because it was an opportunity to have a shared experience with the family, even if it did involve a sport that she doesn’t hold in such high regard. Once everyone had crossed the finish line, we took the ceremonial post-race picture and made our way back to the hotel. Much like the North Shore Half Marathon, this race sells itself on a beautiful, tree-lined course with one gut-busting hill. We were lucky this year to have nearly perfect weather, which is not a guarantee in mid-August. 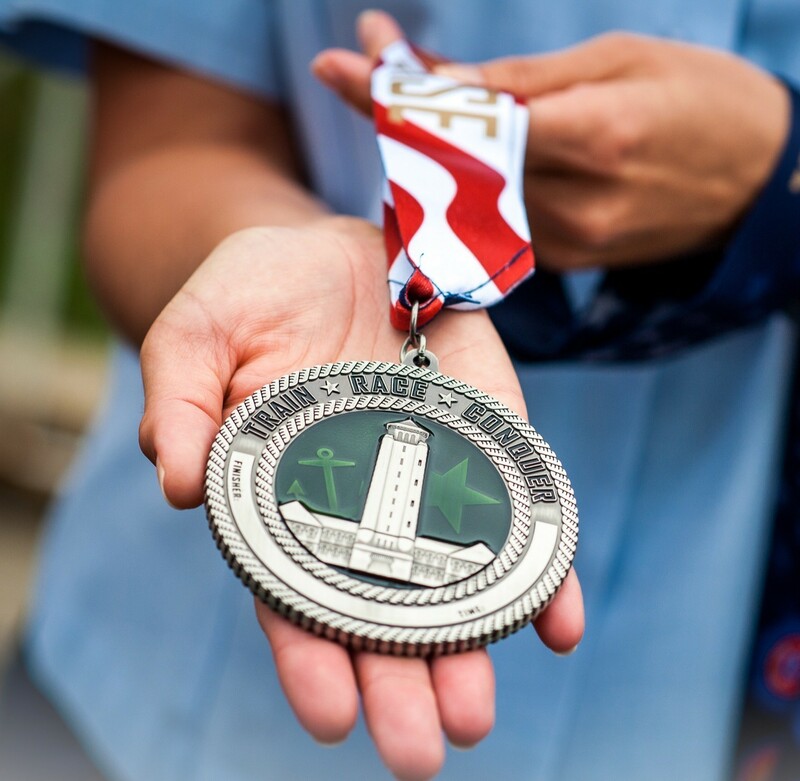 The icing on the cake is the high quality of the t-shirts, bibs and medals. And if that weren’t enough to sell you on signing up for 2016, the race pictures are free! The cynic in you might think that you get one or two blurry shots, but I managed to find ten excellent pictures. If most typical race photography services are feeling generous, they will charge you $20 per digital download, so this $200 value was not lost on me. Big, much deserved props to the organizers for partnering up with Gamefacemedia for this generous perk. All told, if you need a good fitness primer for a fall marathon, a great tech tee to use during training, or a new standout medal with beautiful details, Fort2Base fits the bill.